- Added themes for image export. You can choose a few we've prepared or make your own one by playing with color parameters (format: AARRGGBB - alpha, red, green, blue, all in hexadecimal). Remember that the image refreshes once per 24 hours, so you have one chance per day to check the changes. We'll probably make it simpler in the future. - Fixed the way MALgraph calculates total time spent watching (bug report by LazYSlackeR). Should be closer to MAL's calculations now. By the way, MAL's code fails at basic math, so I wouldn't be surprised if our calculations were closer to truth than MAL's are... just look at the totals below my anime list: "Mean Score: 20.7, Score Dev. : -10.62". - Fixed text color parameters. All themes should work flawlessly now. - Changed "E" to "export"
- Changed "delta_s" to "standard deviation"
Modified the formula for calculating genres and producers. This took a lot of time, testing and thinking; now the results are somewhat similar to the "old" ones, but should be closer to your expectations. Thanks to kFYatek for inspiration. The genres and producers modules use a simpler formula when you rated less than 10% of titles on your list. This means that even if you haven't rated anything, you see more stats than before. Modified achievement images - some of them have backgrounds now. We'll keep updating them. Modified achievement list: fixed grammar (thanks, NavyCherub! ), added a few mecha titles (suggested by KnightmareX13) and ~50 GAR titles (thresholds for GAR were increased too). Added "title" attribute to links in genres and producers. Hovering over a link will show you title count, mean score and evaluated value for given genre/producer. Added 35 mahou shoujo, 17 mecha and 4 SOL titles to achievements list. Thanks to Sae, Roxus13, glitchhunter and Smoku for suggesting them. Regarding manga achievements: I noted down the ideas and will start working on them... later. "Soon" is such an evil word. Maintenance: removed manga entries listed as merged in this thread (from page 63 onwards) => no more links to non-existent entries in list of overlooked manga. Not much of an update... I'll add mecha anime suggested by KnightmareX13 in the next version. Still no sight of manga achievements. Thank you all for your continuous support and suggestions! Almost a year after releasing Mg2, we present you with the new version of MALgraph. 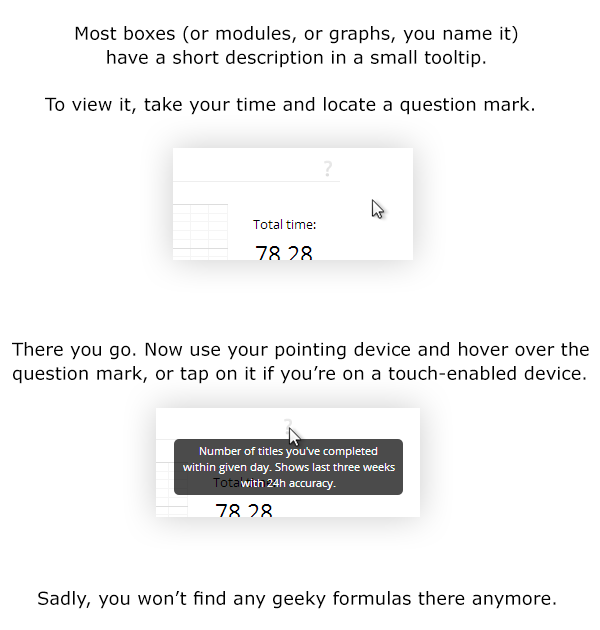 Instead of showing you a cluster of data and unreadable formulas, all your stats are now split into categories. 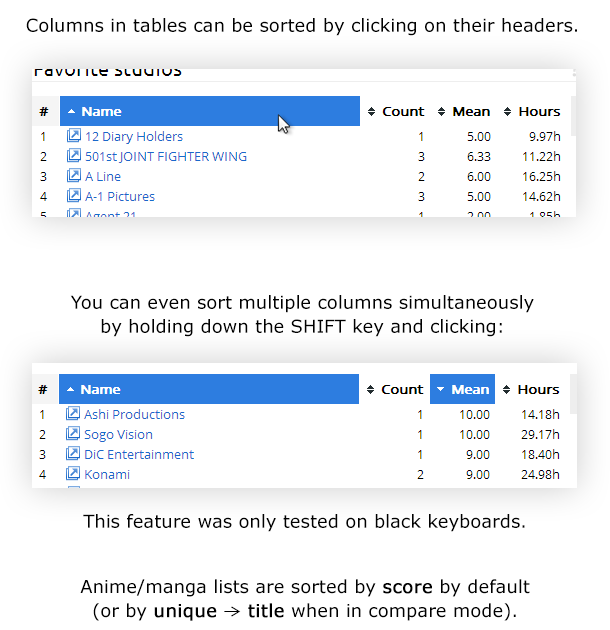 Moreover, graphs and lists became interactive, so you can - for example - view all your manga published in 2009, check anime rated with 3/10, or compare your lists with a friend and sort them to see shared titles. Global stats are back, there's better privacy support and easier image export. Read the full changelog below. aaand it's open source under the MIT license. geez there are ads now, you expect me to click on them? for a free service? We believe we've made the interface fairly intuitive - you should be able to navigate on your own, with no explanations. Anyway, if you want to make sure you won't miss anything, read the image guides below. If something doesn't display correctly, try updating your browser - new versions appear every few weeks nowadays. stock Android 4.0.3 browser, called "Browser"
Thank you for your continued feedback! We hope you like the new version, and if you don't, tell us what you'd like to see changed or added in the Feature requests thread. Yes, we DO read it, and some of the better ideas made it to Mg3. Bug reports are welcome in the cleverly named Bug reports thread. [Fixed] Subtype distribution AJAX length in profile not matching with table data. [Fixed] Subtype distribution has correct header (now: Nonplanned, then: Completed). [Fixed] Bands in fav decades (example: user watched shows from 1970s and 1990s, but none from 1980s. "1980s" wasn't shown nor did it have any background when it should). 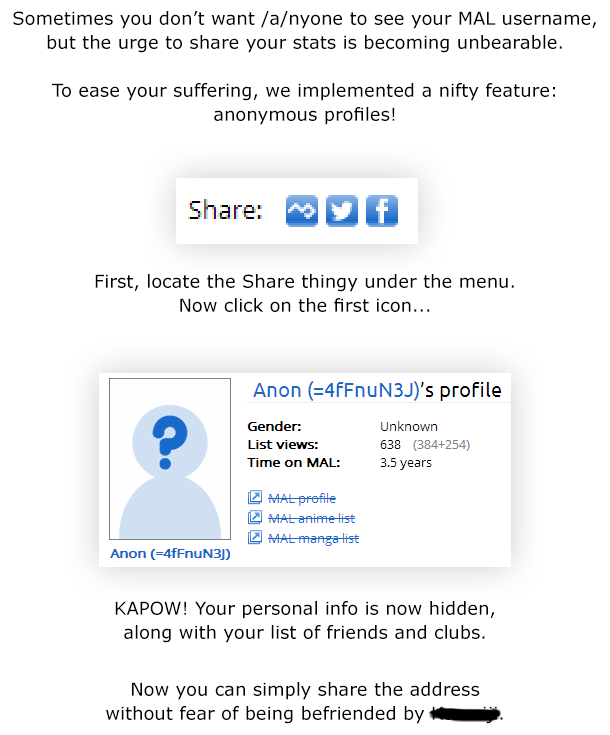 [Fixed] Text style for MAL links in anonymized profiles. [Changed] To speed up things, MG3 doesn't download all friends and clubs anymore. Instead, it downloads random 30 friends and 15 clubs it can find on your profile page along with friend/club count, and if it finds that there are more to show, it links to MAL. [Changed] All links to MAL open in new tabs. [Changed] Shortened table headers in /favs. [Added] Filtering to /list tab due to user request. 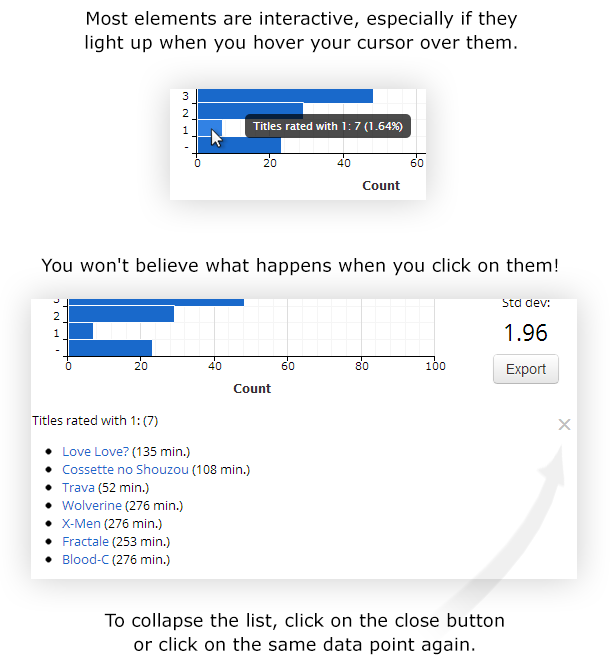 [Added] "Weighted score" to /favs due to few user requests. This is feature from MG2; it tries to merge mean score and number of watched/read entries into cool value that can be sorted. [Changed] Globals do not use any files anymore and are now stored in DB only, due to race condition related problems that kept happening even after introducing file system-independent locking algorithms. Hopefully this is going to be last bugfix/change regarding globals. If you see titles "Unknown entry #xxxx", please report them in shoutbox or in bug reports thread - we usually fix them within a few minutes. I'll add suggested achievement titles soon. Thanks for suggestions. [Removed] The export function is unavailable now. We're testing how it affects the recent server load problems. Exported images will return a placeholder logo until we're sure what to do from now on. Images are back. We decided to keep the changelog on GitHub from now on - it's cleaner and gives us more control as to which version posts are linked to. Read it, check the new version and tell us what you think in the club's shoutbox!